Posted by Mrs Weird Scientist in Animals, Brain Power, Environment, Ocean, Tough Stuff. In fact, it’s good for all living things. Australian researchers recently found that whale poo is battling one of the planet’s toughest battles ever – climate change. The poor whales previously had a horrid reputation. Since they breathe out a common greenhouse gas known as carbon dioxide (CO2), they were disliked for contributing to global warming. Estimates are that they breathe out 200,000 tonnes of CO2 a year. Eep! It isn’t surprising people had a bad opinion of them! But there’s way more to the story than this one fact. Let’s start with the basics and see how something so gross can actually be good for us all. Major science geeks can read the full study results in the Fish and Fisheries journal. A young sperm whale gracefully swims in the Southern Ocean. A trip up to the surface might mean a poopy feeding for the hungry phytoplankton, helping to fight global warming. Image credit: National Oceanic and Atmospheric Administration (NOAA). In the Southern Ocean, we’ve got an estimated 12,000 sperm whales. They hunt down fish and squid for food. Once digested, out comes all that poo. Why should we care about whale feces? Well, it contains loads of iron. 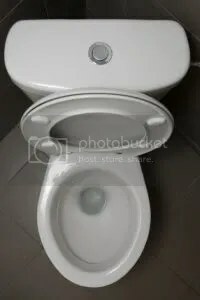 All of those whales poop out approximately 50 tonnes of iron each year. What’s so special about the iron? It’s a fabulously delicious food for phytoplankton, which are marine plants that exist up near the surface of the ocean. These helpful plants like to take in CO2 from the atmosphere through a process called photosynthesis. Better still is that the whales pop out their poop (even I chuckled as I wrote that) in a liquid form that’s close to the surface of the ocean, making it easier for the phytoplankton to access. After, the whale dives down into the ocean, presumably feeling a little – or a lot – lighter! First, we have to see how much CO2 gets sucked up by the plants, which is all thanks to the whale poo. It’s 400,000 tonnes. Now that’s twice as much as the 200,000 tonnes they breathe out through respiration each year. The 200,000 tonnes is equivalent to emissions from 40,000 cars! Our research was actually looking at baleen (krill eating) whales and the iron that they release. The research was stimulated by some ideas raised by Victor Smetacek and we had the samples and the expertise here in Hobart to do the measurements necessary to test these ideas. Many populations of great whales are recovering fairly fast – some at about the maximum rate possible. The best assistance we can give them is to avoid killing them – either accidentally or deliberately. I think an important lesson here is that we can’t judge too quickly and instead, should always look at the big picture. 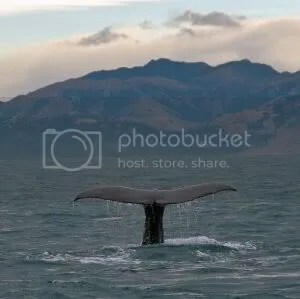 When we first hear about all the CO2 the whales are putting out there, it’s easy to think badly of these massive sea creatures. But with the Southern Ocean normally being a poor source of iron, the whales are making sure those phytoplankton are happily fed. This way, the phytoplankton can do their job of taking out the nasty CO2. 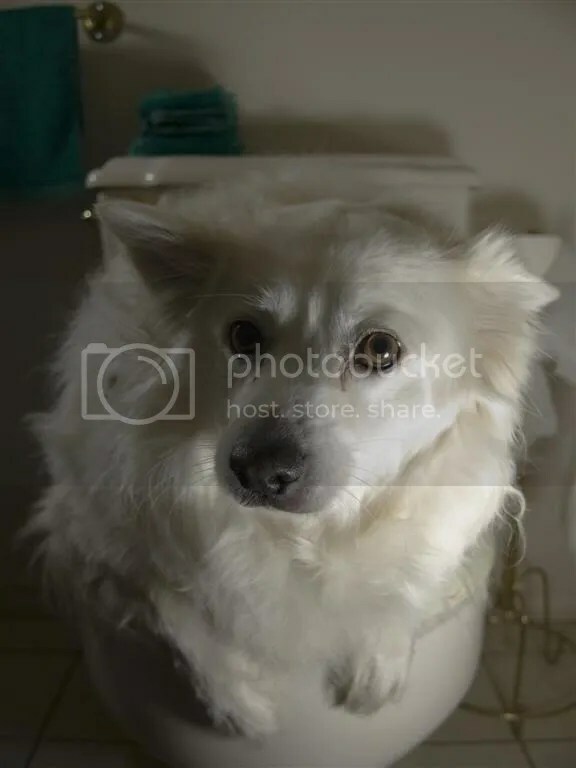 Now, if only human poo had such fantastic capabilities. Posted by Mrs Weird Scientist in Animals, Brain Power, Deep Sea, Easy As Pie, Environment, Evolution, Ocean. Okay well, I made up the name Bartholomew and this interesting creature can’t really speak. But if it could, I imagine it might say something like “Please leave me alone!” So, just what is this odd, slimy thing and why would it want us to stay away? With the formal name of Psychrolutes marcidus, the blobfish is definitely not the world’s prettiest fish. It is, however, on the verge of extinction according to researchers at the University of York in England. For blobfish, home is 800 meters into the ocean, just off the southeastern coast of Australia. 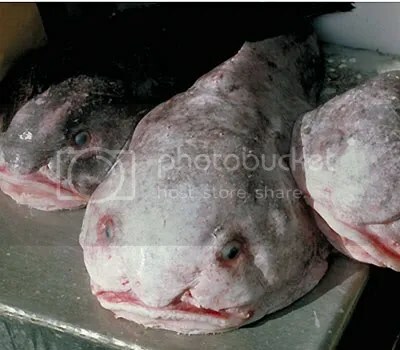 But unfortunately, excessive fishing with nets along the bottom of the ocean has jeopardized the well-being of the blobfish. It starts with overfishing at less deep and murky depths. After reducing populations up there, not much is left. To compensate, we do something called bottom trawling, which takes us even deeper into the ocean. Here, we are fishing along the sea floor. It’s bad news for Bartholomew and all the other blobfish down there. No wonder poor Bartholomew looks so sad. 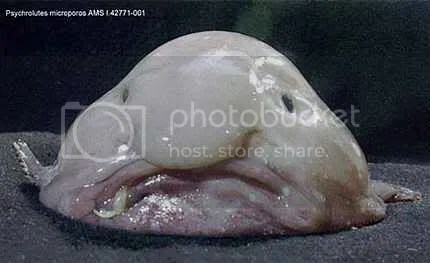 These blobfish may look like your grumpy Great Aunt Martha but they're probably unhappy for another reason. Overfishing is threatening their livelihood. Credit: NOAA Alaska Fisheries Science Center. Just humour me here and let’s keep the name. So what’s life like for Bartholomew? You won’t see it for yourself because Bartholomew lives deep in the ocean, far away from our eyes. That peculiar body serves a purpose, letting Bartholomew sort of float above the sea floor. Instead of using a bunch of energy to move, Bartholomew keeps movement easy and light. How big is this body? A blobfish usually grows to approximately 12 inches (30 centimeters). In fact, I just picked up a comic book I will soon be reviewing here on the blog, and it’s about the same length as a blobfish. And boy oh boy, feeding is an interesting activity for the blobfish. 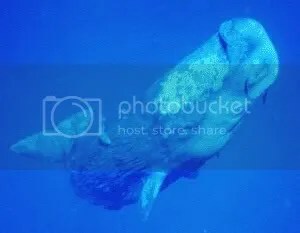 While you or I take an active role in eating – we open our mouths and put food inside – the blobfish does it another way. When Bartholomew feeds, it means just drifting along, swallowing food particles that float in its mouth. Bartholomew is yet another example of the consequences from overfishing. Without adequate regulations around deep sea trawling, our ‘hello’ to Bartholomew may soon be a ‘goodbye’ instead. While his appearance may be ugly, some might say that the actions of humans are far uglier. Posted by Mrs Weird Scientist in Brain Power, Easy As Pie, Environment, Human Body, Ocean, Psychology and Behavior, Technology. Tiko looks like he's immersed in the new Ripley's book. But looks can be deceiving! We all know dogs can't read. Hmmm, perhaps Tiko is captivated by the cheddar cheese carving on page 130 of the book. Tiko loves cheese! Should you believe everything you see? Well, in the case of the Ripley’s book that I was recently sent to review, you can believe most of it! 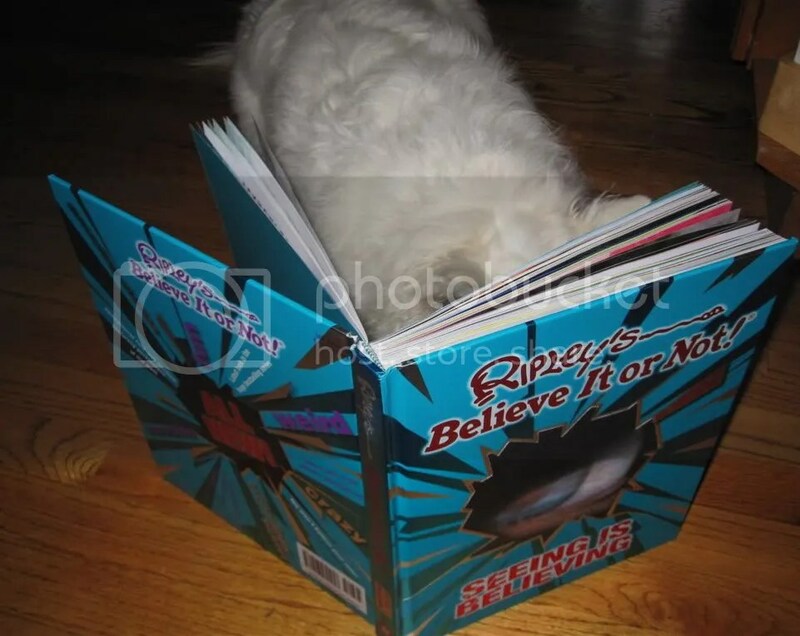 The new Seeing is Believing book by Ripley’s Believe It or Not is a bright, colorful book with a rather creepy but intriguing eyeball on the cover. No matter what age, people like weird stuff and they like simplicity. Ripley’s manages to do both and do it creatively in a way that speaks to young and old alike. My excited thirty-one-year-old friend enjoyed the book as did his nine-year-old son. After all that pretending to read, Tiko awaits a liver treat for his hard work. I'll bet he's thinking that being an actor sure isn't easy! 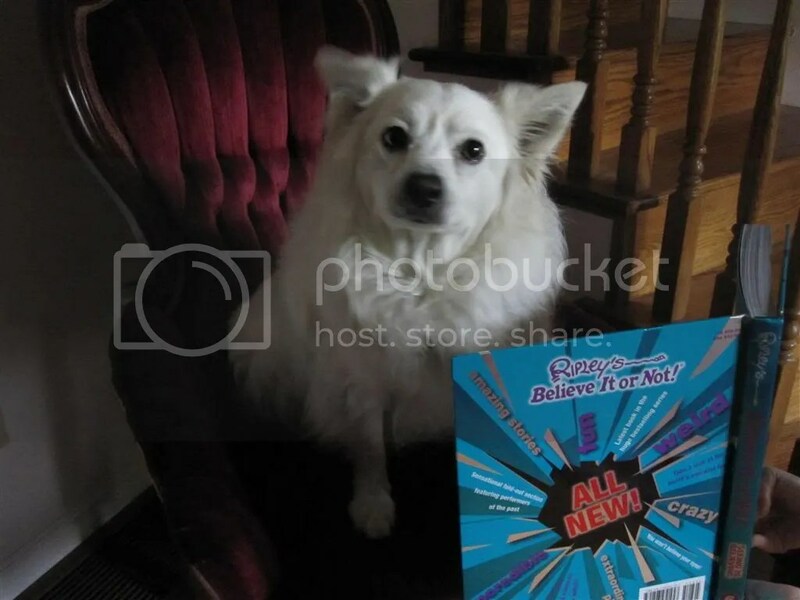 Just how much of the new Ripley’s book is believable though? While the publishers do put a disclaimer that they aren’t responsible for the accuracy of the book, it’s still reasonably expected that the tidbits of information are true. Not so. I spotted a headline titled Glandular Fever. Of course, my UK readers will likely recognize this as the term for what we call infectious mononucleosis or mono here in North America. It’s caused by the Epstein Barr virus and because it can be transmitted through saliva, it’s often called the kissing disease as well. Expecting to read about mono, I was surprised to read about a woman who had an imbalance of hormones that caused her to experience excessive hair growth all over her body. My sense is that Glandular Fever was meant to be a catchy title but nobody realized it was the term for another health condition. Still, a minor inaccuracy or few doesn’t at all break the fantastic impact and enjoyment of this quirky book, but it’s perhaps a reminder to kids and adults that there is a lot more to science than meets the eye. Find out more at the Ripley’s website. A Weird Science Contest: Win The New Ripley’s Book! I like contests. Do you? If so, I want to invite my readers to send an email telling me about the grossest or weirdest thing they’ve ever seen in science. It could be something from science class or maybe just a creepy picture of a bug. If you do send a picture, make sure you include a description of why you think it’s so weird! Anyone aged ten to sixteen can enter. The contest closes on the 15th of October, 2009. Please also get permission from your parents before entering. Any entries from under 13s must be done through a parent’s email address and must also include a telephone contact number for the parent. If you’re a winner, either you or your parents will be contacted for a mailing address to receive your Ripley’s book. Posted by Mrs Weird Scientist in Brain Power, Environment, Evolution, Tough Stuff. Summer is still going strong but soon it will be fall – a time when we can enjoy the pretty autumn leaves. Or as I always like to do, throw leaves at my wee dog and race through the massive piles of foliage. 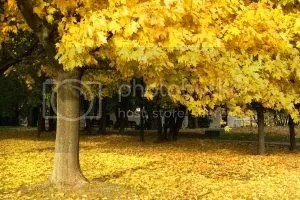 Unless you’ve traveled a bit and have a sharp eye for detail, you might not have noticed that autumn leaves are usually red in America but yellow in Europe. Seems strange, doesn’t it? If you’re wondering why, then you’re not the only one. Two professors thought about these differences too and they came up with a cool theory. Prof. Simcha Lev-Yadun of the Department of Science Education at the University of Haifa-Oranim in Israel and Prof. Jarmo Holopainen of the University of Kuopio in Finland had their work published in New Phytologist. 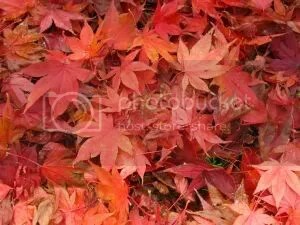 Red leaves in America serve as a warning flag to ward off insects. But in Europe, none of these evolutionary 'tricks' are needed, which means leaves are yellow. To find out more, we have to step back 35 million years to sort out the mystery. Up until that time, huge areas of the globe were rich in evergreen forests. Then, a bunch of ice ages and dry spells came into the picture. Lots of the tree species evolved to become deciduous – meaning they lose their leaves depending on the season. Some trees even started to produce red leaves to keep the pesky insects away. But, something else came into play and you might be surprised to learn just what it was! It’s true. We have to check out the orientation of the mountains to get the scoop on why the leaves evolved to be red in America but yellow in Europe. In North America, north-to-south mountain chains created a protected area, enabling the plants and animals to migrate south or north. Joining them were the insects. So, the leaves in America remained red to continue warding off these annoying bugs. But in Europe, the mountains are oriented from east-to-west, leaving no protected areas as the ice and other environmental conditions came to visit. Loads of the tree species just couldn’t survive the extreme cold. When they died, so did those insects that needed the trees for their survival. By the time the ice ages were over, those trees that had managed to survive didn’t have to deal with the now-extinct insects. So, no need for red leaves to keep them away! I wanted to be a biologist and archaeologist since I was ten years old. For me, science is a lifestyle, not a job. At the age of 57…I look backwards and see that I made the right decision. He also shared his plans to meet up in Scandinavia with his colleague Jarmo Holopainen, where they hope to find out even more about why plants have such cool and different colors. While my dog Tiko probably doesn’t care much about leaf color when he dashes through the crisp autumn leaves, I like to understand what makes one leaf a bright yellow and another a brilliant red. Now, if only leaves could somehow evolve to become fluorescent pink, my favorite color. Somehow though, I just don’t see it happening!